Hailing from Rennes, France this weeks first 'Dose, Brain Pyramid, aren't afraid to compound a pliable blues structure and jazz time signatures in effort to create their own versatile and authentic chronicle in the vast halls of psychedelic and acid rock. 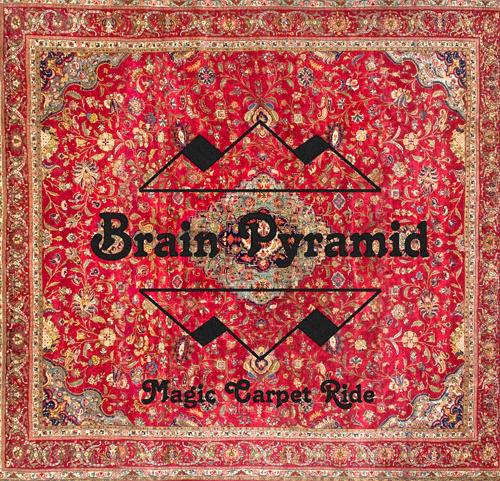 Brain Pyramid envisioned a narcotic induced composition and liberated it, choosing the title Magic Carpet Ride. A fitting title indeed. Wasting little time getting your mind's eye operating the trio flick their favorite Zippo and the EP opener Bad Luck is strutting through a discordant jazz based instrumental track with that signature seventies sit-com distorted guitar whurl. Bad Luck is engulfed in a cacophony of rhythmic tidal waves, leaving the guitar submerged in the mix before triumphantly resurfacing. A spoken style of vocals materializes in the midst of the heavy and gnarled chord progression of track two, Stone Woman Blues. This vocal approach is carried throughout Magic Carpet Ride, always buried in the mix and an accoutrement to the bounteous slabs of blues RIFF'ing. The prize of the pack for this listener is Mary Jane Blues, a song driven by a slide acoustic guitar, a whole lot of pluckin' and some old time hand clappin'. The track shines with a south-western sweaty-sheen and character that I admire. The fellas then bounce back to the blues focused grooves with the heavy-weight EP closers Cosmic 1000 Years and Electric Spell. Check them all out at bandcamp where Brain Pyramid are offering the download at a "name your price" cost and a limited edition CD for about $5.00.